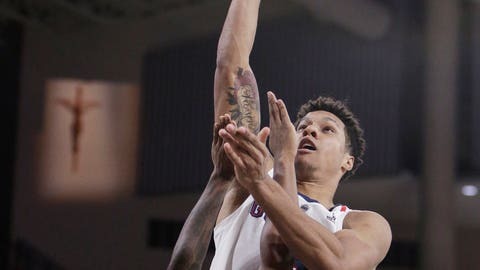 SPOKANE, Wash. (AP) — Top-ranked Gonzaga is heading into a tough stretch without two of its key players. “Those are four tough games,” Gonzaga coach Mark Few said. Tillie, an NBA prospect who is a big scorer and rebounder, injured his ankle a month ago in practice and has yet to play. He’s forecast to return in about a month. The Bulldogs (7-0) have weathered the loss of Tillie because they are deep in the front court. Crandall’s injury puts more pressure on starting point guard Josh Perkins, who is likely to play a lot of minutes in close games. Perkins played 38 minutes in the victory over Duke last week in Maui that propelled Gonzaga to the No. 1 ranking in The Associated Press Top 25. Perkins, a fifth-year senior, is averaging 11 points and eight assists per game. “He’s done a really good job of getting us in the right spot, making the right decisions and playing with great pace,” Few said. But he added that he was honored by the ranking. “I appreciate that people think so highly of us,” Few said.